Jim created a special sauce for his sandwiches, and never worried about measuring ingredients. He chopped onions with a French knife and tossed them in a pot with tomato paste and spices. Luckily, Al's wife Liz had watched this process and was able to assist Al in recovering the recipe after Jim passed away. But something was missing and the customers immediately noticed the difference. They told Al that the secret of the sauce went with his dad. About a week after Jim passed, Al was asleep and a vision of Jim appeared at the foot of his bed with a grin on his face; he said, "I told you that you should've watched me." Although Al never believed in anything spiritual he asked, "What am I doing wrong?" Jim said, "think," and it came to Al immediately. It was four in the morning but Al jumped out of bed and went to the kitchen and made a batch of sauce - it was perfect! Jim's Famous Sauce is now the foundation for the business. Al managed to standardize the amounts, and although the sauce was a bit spicier than the original, customers liked it and started begging to purchase some. Soon, Al and his nephew Brian Homoki were making 10 gallons a day. The sauce was sold to customers in pint-sized plastic containers and by 2003 they starting bottling it. To keep up with the demand, two companies are involved: one provides the spices and the other cooks the ingredients, adds the spices, bottles and ships; 500 gallons are produced at a time. Neither company has access to the whole recipe. The sauce has a tomato paste base, but it does not taste tomatoey. Although it was created to enhance hot dogs, customers have enjoyed using it on chicken, pasta and other meats. It's got a little bit of tang to it and has a good shelf life. 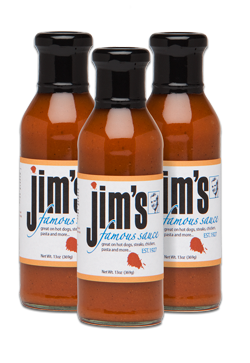 As of 2011, Jim's had sold about 1/4 million bottles around the country and has shipped sauce to customers, including soldiers in Iraq. People buy it to give as gifts, sometimes purchasing several cases at a time. Consistency. The Jim's team just keeps doing the same thing that Jim did. When Jim started his restaurant he had a full-scale operation, but the Depression came along and restaurants didn't do so well. So he started selling hot dogs for 5¢ apiece. He had lots of sandwiches. Using a blackboard for daily menus, he simply erased the ones that weren't selling. He narrowed it down to five sandwiches: the hamburger, barbecue, hot dog, kielbasa and Italian sausage. Today, the folks at Jims still provide the same level of consistency and commitment – Al's late nephew Brian had been there for 30 years, Tim and Mike have been with All since the early 90's, Matt and others have followed in the footsteps of several generations of family members. They're serving customers who are the fifth or sixth generation. Those who move away revisit. Word of mouth has created the market. Although the steel industry left the area and there was a deep recession, Jim's has shown at least a 10% business increase each year.